The Vivekananda Kendra Institute of Culture, Guwahati conducted a short term course on Transcription, Report writing and Visual Documentation from July 25th to July 28th, 2018. This full day workshop was attended by 10 students pursuing Masters Degree in Anthropology and other members of the Kendra. On the first day, the session began with an introduction of Vivekananda Kendra Sri Dipankar Mahanta. He enriched the students with the life and memorable events of Swami Vivekananda along with the establishment of the Kendra and its different chapters. A session on the basic ideas about transcription was taken by Sri Prabal Kr. Das after a short tea break. The participants were also given a video as an assignment. Another session was held under Sri Mridul Chakraborty who presented slides on the lifestyles of different tribes and wrapped up the activities for the day. The second and the third day continued with Visual Documentation, handling of camera, clicking photographs, interpreting a visual document along with its insights and importance. 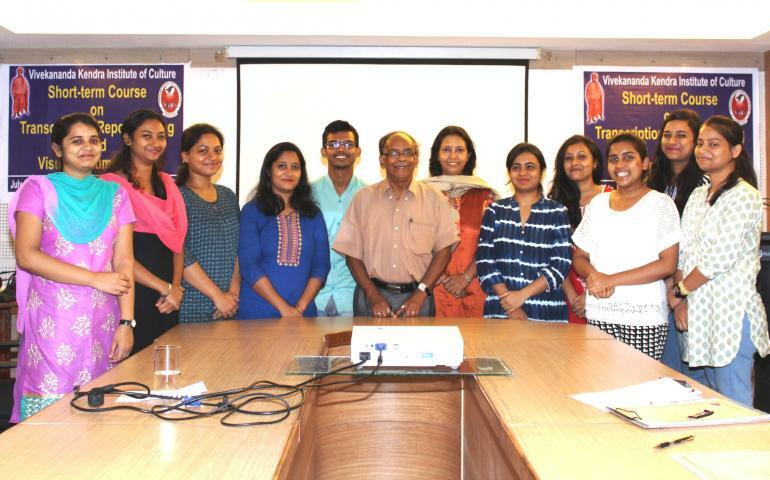 The session for Report writing was covered by Dr. Kalyan Das who upgraded everyone with his knowledge; the participants were taught and guided with the fundamentals of research methodology. On the final day of workshop, Prof. P. C. Bhattacharjee made a visit and presented a picture of his workings on the wildlife conservation in Assam. He presented Certificate of Participation to the students and conducted a small talk on the feedback and suggestions for the workshop. A visit to the library of the Kendra was made by the students with Shri Mridul Chakravorty.